After Attack, Israel Imposes New Movement Restrictions On Palestinians : The Two-Way Israel says it is suspending tens of thousands of movement permits for Palestinians a day after four Israelis died in a mass shooting at a Tel Aviv food and retail center. Israeli soldiers walk near a temporary checkpoint at the entrance of the Palestinian village of Yatta in the West Bank on Thursday after army forces entered the village in search of clues to Wednesday night's shootings in the Israeli city of Tel Aviv. Israel says it is suspending tens of thousands of movement permits for Palestinians a day after a mass shooting at a Tel Aviv food and retail center that killed four Israelis. Israeli police identified the gunmen as two Palestinian cousins in their 20s. They were apprehended Wednesday night, and one of them "remains in an Israeli hospital after being wounded by security forces responding to the attack," NPR's Emily Harris tells our Newscast unit. Israel has "frozen permits for more than 80,000 Palestinians to visit relatives in Israel or pray in Jerusalem during the Muslim holy month of Ramadan, which started this week," Emily reports. 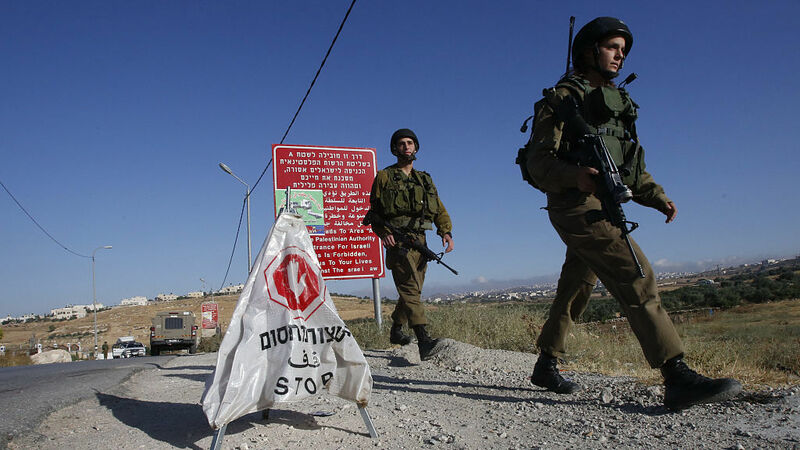 The country's military has also sealed off the suspected gunmen's village of Yatta in the West Bank and is carrying out searches, Emily reports. According to The Associated Press, the Israeli defense body responsible says "entering or leaving will only be permitted for humanitarian and medical cases." Additionally, the wire service reports that the military has also "frozen Israeli work permit for 204 of the attackers' relatives." Israel also is preparing to demolish the home of one of the Palestinian men, according to the AP. It adds: "Israel often responds to attacks by demolishing the homes of the assailants or their relatives — a tactic that is criticized by the Palestinians and human rights groups as collective punishment." The army has also carried out "an unspecified number of detentions" in Yatta, the Ma'an News Agency, a Palestinian wire service, reports. "Life in the Yatta village won't carry on as usual. A village that has terrorists leaving from its midst will pay the price," Deputy Defense Minister Eli Ben-Dahan says, according to Haaretz, an Israeli newspaper. 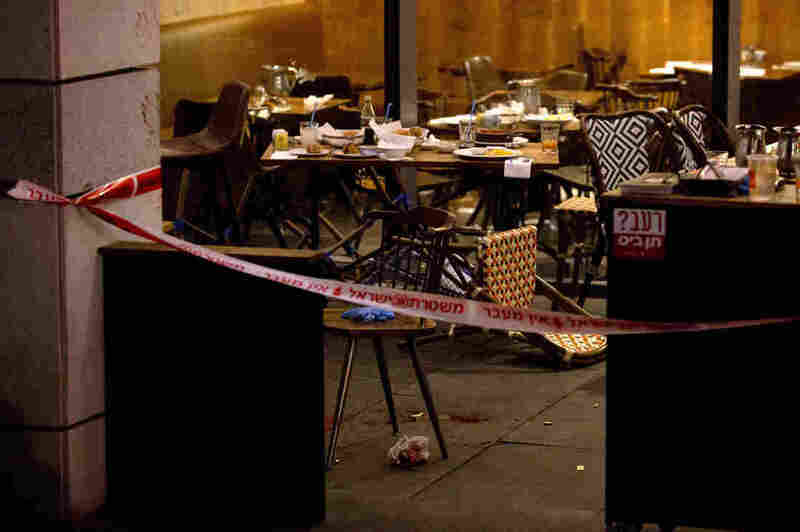 Meanwhile, Haaretz reports that the victims of the attack have been identified as 42-year-old Ido Ben Ari, 39-year-old Ilana Neve, 58-year-old Michael Feige, and 32-year-old Mila Mishayev. The newspaper adds that Ben Ari was eating at a restaurant with his wife and two children at the time he was killed. According to the AP, Feige was a professor of sociology and anthropology, and colleagues from his university said he was "the incarnation of a man of reason, tolerance and peace." As Emily has reported, a wave of attacks by Palestinians have killed 30 Israelis since last fall, primarily in the West Bank and Jerusalem. And in that time, "over 200 Palestinians have been killed by Israeli forces — a majority, Israel says, while attempting attacks." According to Reuters, Wednesday's shooting was the "deadliest incident in eight months." No group has claimed responsibility for the attack. At the same time, as Emily reports, "Hamas, the militant Islamist Palestinian group, praised the attack and threatened more." " 'While Israel has the right to enact necessary and proportionate measures to protect those under its control, Israeli forces must not respond to these attacks with further measures of collective punishment or other disproportionate actions, which would themselves violate international law,' said [Philip Luther, Director of the Middle East and North Africa Program at Amnesty International]. 'Sadly, Israeli forces have a history of using excessive measures in retaliation for attacks, including blanket restrictions on Palestinians' movement and the demolition of attackers' family homes.' "